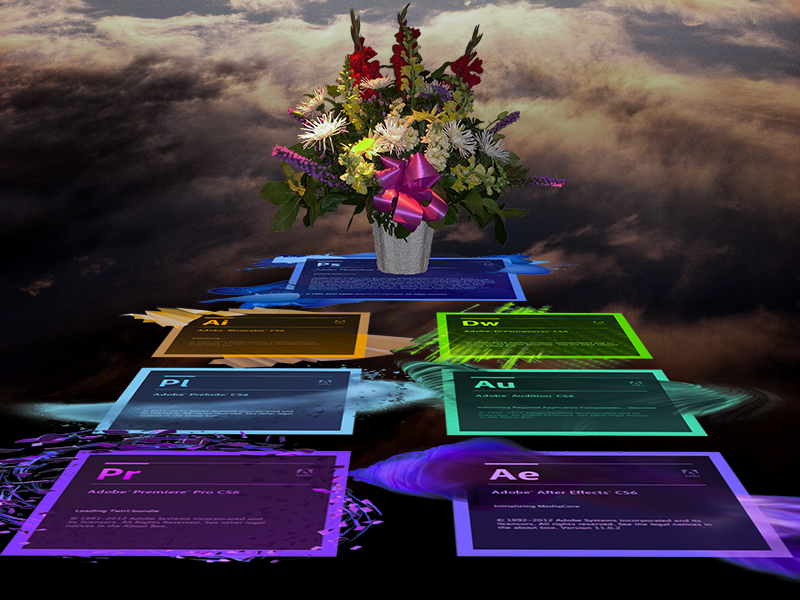 Adobe Master Collection CS6 may be my last version. Back in June, I wrote about My Problem with Adobe Creative Cloud. Now that Adobe has become a subscription-only software product, I have had to come to terms with the fact that the Adobe Master Collection CS6 may be my last version. Don't get me wrong, I still think Adobe makes great software, but their new licensing model has made it impractical to maintain. It has always been nice to pay once and use the software whenever I need it, for however long I want to, but those days have come to an end. If I need to use any Adobe software for a day, I have to pay for a month. Hey Adobe, why can't you follow the example set by GenArts? For those of you unfamiliar with GenArts, they build high-end visual effects plugins for all of the major editing and effects applications. GenArts started the whole rental model concept way before Adobe, but they give customers an option. 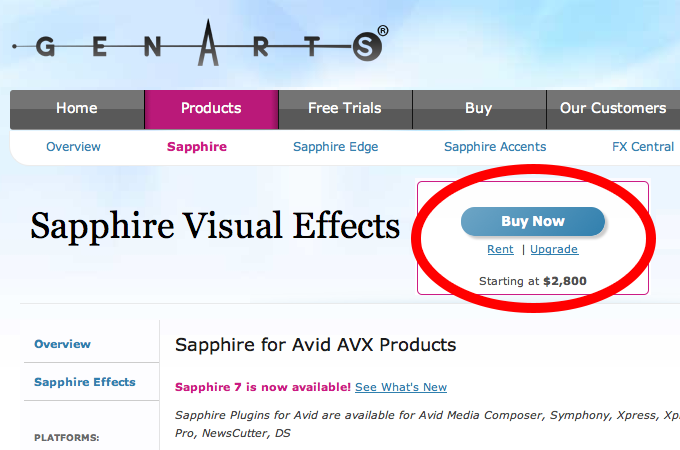 You can either buy or rent their software. The key is offering your valued customers a choice. I've read articles that claim that the subscription model may have an effect on the hobbyists who use Adobe, but not necessarily the professionals. I have to disagree, I'm a freelance video professional, and it is not practical for me to subscribe. It most likely won't have an effect on all of the large post production facilities. It's the freelancers who will be affected the most. This includes video freelancers, graphic freelancers and web freelancers as well. In my video editing workflow I use all of the 'Big 3": Adobe Premiere Pro CS6, Apple Final Cut Pro (v7) and Avid Media Composer. The future roadmap for Final Cut Pro was altered when Apple decided not to continue with Final Cut Studio and the professional tools it contained. In a way, Adobe is doing a similar move with the Creative Cloud subscription model. They are alienating a good portion of their users. I have always preferred the Avid Media Composer, so I don't have a real problem with losing Premiere Pro, but I'm sad about the loss of Adobe Photoshop, Adobe Illustrator and Adobe After Effects. I'm not sure what software I can use to replace those very powerful applications. Maybe I should start looking at Nuke to replace my After Effects, or more realistically, get more used to using Avid FX (Boris RED) in my Avid Media Composer and Gimp to replace my Photoshop. You're right my previous post My Problem with Adobe Creative Cloud offered my arguments of Adobe Creative Cloud's failings, this post was more of my response to those failings. Nuke may be a little bit of an overkill, I guess I'll just stick with Avid FX (Boris RED) which is part of the Avid Media Composer. It may not be After Effects, but it comes close and the integration with Media Composer is great. Thanks Tom, I'll check that out. I think the problem I have with your commentary is that is not based on VALUE - it's based on your DESIRE to own vs. rent. You're OK spending $999 on Media Composer as a new seat knowing that unless you buy a support contract you are not allowed to have a single new update or feature - EVER? As an individual CC is $49 a month (for everything Adobe makes - not just one product, updated on a constant basis) - which equals 3 Starbucks lattes a week. Can you really say that the full suite of Adobe tools can't generate $49 of value for you on a monthly basis? If you don't feel like subscribing - don't, but as a professional with great skill don't say the financial model doesn't work, you just don't like it - which is an entirely different thing. Anonymous, I'm okay spending $999 on a Media Composer system, because in doing so I maintain the choice of when it is necessary for me to upgrade my software and hardware - Avid doesn't tell me when I have to do so. If I decide I want to keep my existing hardware, I know that my Avid Media Composer will work just fine for as long as I want to use it. That is why I will continue to use Adobe Master Collection CS6 as well. I think the Adobe Creative Cloud subscription is good in many ways for a facility, but it is not good for me as an independent. Being apart of a group of video contractors Adobe CC is definitely saving us money while allow us to use the latest creative tools available. Financially it makes much more sense for us then buying a new version of Abode Master suite every two years to stay competitive. As far as hardware is concerned we are constantly upgrading our computers just in effort to keep up with client demand. I suppose if you are only doing one or two jobs a month, then the work hardware problem would be a financial strain. One way or another though you have to find value with that Abode Master Suite or its a tough pill to swallow. In general Adobe bases their next generation of software on the last generation of hardware which it supports typically for 3-4 years. So unless you insist on using computers that are 4-5 years old to do your work you'll save money. Your problem seems to be in the ethical quandary of a company controlling your software which is a valid concern. I supposed I should move to Linux and find some open source video and effects software. I struggle with the ethical quandary as well. There is something comforting about having that boxed software on the shelf… but I did the math. I was upgrading approximately every-other release of Adobe CS. In between releases I was always wanting of the new features but rarely felt made the decision to pay for them. Now paying monthly I'm paying almost EXCTLY the same amount over the 2-3 year upgrade cycle (apparently Adobe did the math as well) but now I have access to all upgrades and a host of products I never would have paid for. I'm a video guy that used Adobe Muse the other day. It was a simple favor I did for a good client, but I had the ability to use that software. If I ever need it again then I have access to it whenever necessary. "Anonymous, I'm okay spending $999 on a Media Composer system, because in doing so I maintain the choice of when it is necessary for me to upgrade my software and hardware - Avid doesn't tell me when I have to do so." Thanks Anonymous, I'll probably just stick with my CS6 and wait and see what Creative Cloud has to offer in the future. Our software is online but you can use it for free. It’s not a substitute for AE but it might get you where you need to be. We let graphic designers use our system for free. Their clients then pay for the finished video product or you can pay directly and charge your clients whatever you going rate is. There are some limitations to what you can do. If you’re interested in learning more, check out our site (www.visiblespectrum.com). I am a freelance videographer and I'm quite happy with Adobe Cloud. It made sense for me to get the Master Collection because I use such a range of their products. But it was nearly impossible for me drop $2,500 on buying the whole set. Paying $50 a month and knowing that I won't have to shell out another large chunk of change every year or two for the inevitable upgrades is fine by me. I'd much rather pay monthly and know that I'll always be up to date. To each their own. I own a modest media company that just grew out of being a freelance independent last year and the Adobe CC subscription keeps me up to date with what I want, I only move to the next release when and if I want to and it has ended up saving me money over constantly buying new versions of the various programs I use for two workstations. Even for small shops or freelance people this is a good buy and well worth it. I am afraid that you missed the fact that you are not forced to upgrade with each release. Also my freelance just turned media shop (in line with freelance level as our shop has two full-time employees) benefits greatly from the CC subscription plan which is very different from what you expect the freelancers to experience. Plus it is an even cheaper rate for individual programs for those who do not use so many programs. I would suggest a little more research before writing and posting something that may influence others and damage a company. I'm not really enamored with a company that loses the private information of 2.9 million users.